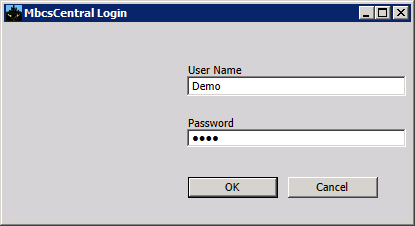 PREVIOUS NEXT Until this point, the logins have been for gaining access to the cloud servers. Now you are ready to login to the MbcsCentral application. In actual use, all persons to whom to you grant access will use the system assigned client username and password to access the server. For each authorized person you will assign a separate username and password as well as a set of permissions. The permissions determine what parts of the program they can access and whether or not they will be able to make changes. Once successfully logged in the MbcsCentral Menu will appear. You are ready to explore.